“Sit silently with the artist for a duration of your choosing”—so the instructions read on a small plaque in the second-floor atrium at The Museum of Modern Art. Behind the plaque, a queue of visitors forms, eager to enter a large square space—demarcated only by tape on the floor—to sit down at a wooden table across from a dark-haired woman in a navy-blue dress that conceals every part of her body save her face and her hands. The woman is the pioneering artist Marina Abramović, but its likely that few of the people in line have any sense of this woman’s indelible impact on contemporary art. As I wait, an anthology of her performances scrolling through my head. Watching her from afar, I look to see the courage and fearlessness in a woman capable of incising a five-pointed star on her own stomach, screaming until she loses consciousness, and living in a gallery for 12 days without food. Strangely, she doesn’t seem reckless at all, but peaceful and wise. I then remember she trained with Tibetan Buddhists and has said she’s able to transcend the limits of her own body and mind through meditation. She’ll need these skills now more than ever as she attempts her longest performance-to-date, sitting at this table for every hour of every day that her retrospective is open at MoMA. No food. No water. No breaks. So, I wait for my moment with the artist, a once-in-a-lifetime opportunity. A young girl is sitting across from Marina and the two seem engaged in a staring contest, though from that distance it’s impossible to tell if they’re actually making eye contact or simply staring ahead in a daze. Seventy-five minutes later she finally stands up and exits the square, declaring she lost all sense of time and thought it had only been a few minutes. Marina leans forward and closes her eyes, while the next sojourner steps forward and takes the empty seat. Marina sits up and another staring contest commences—this one lasting sixty-seven minutes. This process repeats—ten minutes, fifty-five minutes, twenty minutes, forty-five minutes, etc. Finally, the man in front of me takes the seat and I’m next. More than three hours from when I entered the succession I’ve seen only six people participate in the performance and more than thirty leave the line in frustration. The nameless, faceless strangers I queued with hours ago are now friends—an artist from Poughkeepsie, an art history undergrad from Chicago, a nurse from outside Philly—and we share our excitement as our turn approaches. Finally, after nearly four hours, my time has come. I enter the square and approach the table, immediately noting the heat of the lights and the watchful eyes of the crowds gathered to gawk at the spectacle. I put my purse on the floor and take a seat. While Marina leans forward, I settle into the chair and imagine I’ll last about ten minutes before I become either bored or totally uncomfortable. She begins to sit up and I try to prepare myself for the moment she opens her eyes. I have many skills, but sitting still and being silent are not traits I’m known for, so I was afraid: afraid of the judgment implicit in staring, afraid of the silence, afraid I wouldn’t have the transformative experience that had captivated those before me, afraid, afraid, afraid. Her lids opened and our eyes locked, not in a stare but in a friendly gaze. For the first few minutes, I thought only about who this woman was—a renegade, a feminist, an inspiration—but quickly realized that those things were more about her persona than the person. I discarded my preconceived notions and expectations and, as soon as I stopped thinking of her as an artist-celebrity, saw the woman behind the legend. We sat absolutely still in deafening silence, exchanging energy, and just being with each other. I’ve heard it said that couples married for decades can sit in silence and understand one another perfectly, but I’d never imagine that sort of intimacy could be possible between two total strangers. It is. I could have stayed in that moment for hours but thought of my fellow line-mates, now friends, and decided it would be selfish to bask in this experience any longer. But, could I leave? It felt as rude as leaving a lecture in the middle. How would I leave? Abruptly just wouldn’t do, so I said good-bye and thanked her. More than thirty minutes had passed, thirty minutes of epic silence I’ll never forget. 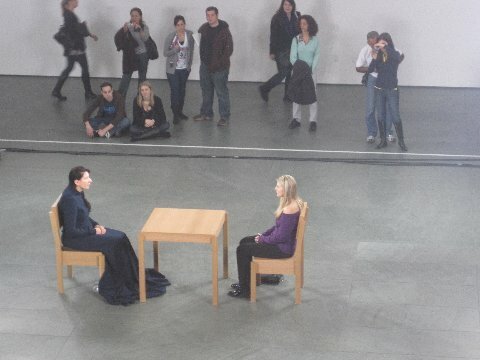 Cite this page as: Rebecca Taylor, "Marina Abramović, The Artist is Present," in Smarthistory, August 9, 2015, accessed April 22, 2019, https://smarthistory.org/marina-abramovic-the-artist-is-present/.